Crawley District Scouts are holding an information and activity open day on Sunday 19th July at Maidenbower Park Community Club. 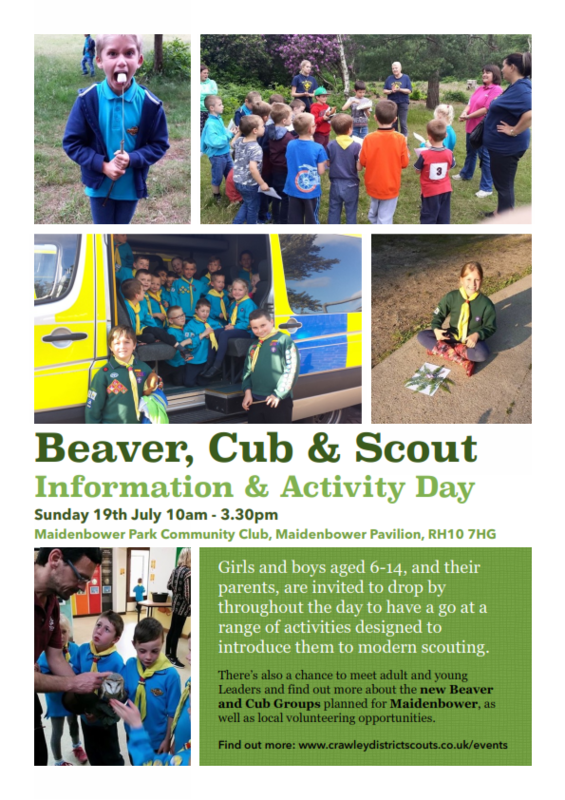 The day will run from 10am – 3.30pm and will feature rolling activities throughout the day, for boys and girls aged 6-14, and their parents, who want to find out more about Beavers, Cub and Scouts. There will also be the chance to talk to adult and young leaders currently working across Crawley District. The event is being coordinated by 5th Crawley Scout Group, based in Three Bridges, with the aim of identifying demand for new sections to be run in Maidenbower. 5th Crawley leaders are also keen to speak to any potential adult volunteers who are interested in getting involved with new or existing Groups across the town either as Leaders or parent helpers, and interested adults are invited to drop-in on the day to find out more.